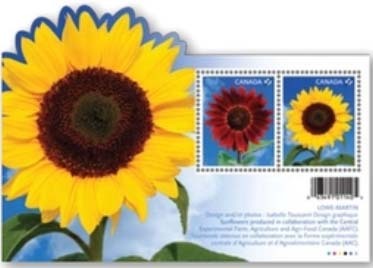 On March 3, 2011, Canada Post will begin issuing a new series of stamps featuring flowers. This is not the first time that flowers have been a theme for Canadian stamps and this new series will definitely not disappoint. Just in time for summer, these bright, vibrant flowers smile at us from very colourful blue backgrounds. Sunflowers have a special place in Canadian history, being a source of food and oil used by Native Americans right down to our modern times.